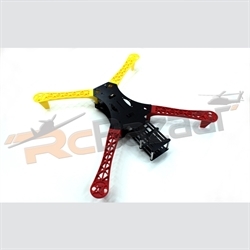 This is a simple Quadcopter frame specially designed for FPV use with a GoPro size camera. The plastic arms are positioned in a special way to keep the propellers out of the camera view. The fiberglass central plates have extra space for your FPV gear and also includes a 2 axis aluminium gimbal. The Gimbal features vibration a vibration damping system to keep your video smooth and stable with no 'jelly' effects.